I gave my niece a 500 pack of Bendaroos for Christmas. 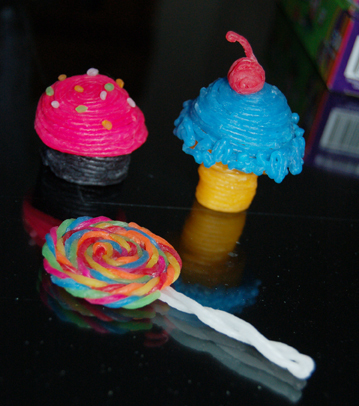 Bendaroos are simply wax coated colored strings that are bendable sticks. When Rachel went to bed every night, Avery and I played with a lot of her new Christmas Toys. Our list included playing with Bendaroos and Moon Sand, Monopoly, Cootie and her other new games. 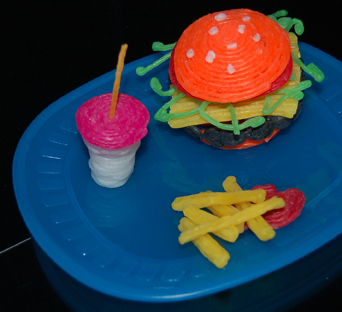 Bendaroos were somewhat boring if you ask me, but I took the instruction sheet and was determined to make a hamburger. The directions were a bit advanced, but Avery was able to help my sister and i with some of the prep work in making the burger. She cut the strings in half, she counted the colors we needed, she even rolled some into small coils for us. Once the burger was complete, it was time for Avery to go to bed, but my sister and I dove into the Bendaroos on a much larger scale. We stayed up until midnight creating the creations to surprise Avery the next day. She was very excited! 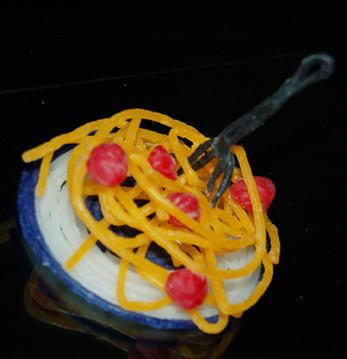 My sister made this plate of spaghetti. And no meal is complete without dessert!